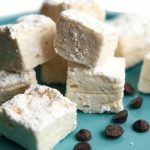 These vegan marshmallows will amaze you! Easy to make, light and fluffy, sweet and delicious, this is the BEST way to make homemade vegan marshmallows by far! Toast them over a campfire, put them in your hot chocolate or simply eat them for a sweet treat! 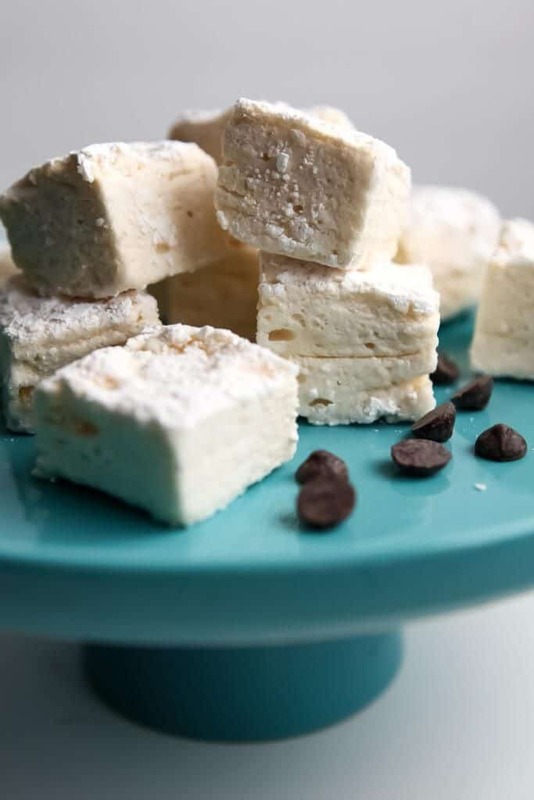 I’ve attempted many different vegan marshmallow recipes over the years, and they have all completely failed until I started making them this way! This recipe emerged out of a marshmallow topping a created for my vegan smores pie. I had been making a lot of aquafaba whipped cream, and thought that I would make it firmer with some agar agar (vegan gelatin) for a marshmallow-like topping! After a little trial and error, it worked perfectly as a pie topping. However, it needed a few more adjustments to make it into vegan marshmallows. To make a true vegan marshmallow, I adapted the recipe to make it firmer and dry the marshmallows out slightly, so they would have the right texture. Finally, I have perfected the vegan marshmallow recipe that actually works! free of all major allergens including gluten, soy, and dairy! a vegan marshmallow recipe that actually works! Powdered Sugar – for dusting the marshmallows. Baking Dish – an 8″ x 8″ baking dish is the perfect size to use as a mold for your marshmallow. Cookie Sheet – for spreading out the marshmallow and letting them dry out a little. How do you make vegan marshmallows? Dust the bottom of an 8″x 8″ pan with powdered sugar and set aside. Quickly pour it into the pan that has been dusted with powdered sugar. Dust the top of the marshmallows with powdered sugar and let sit and cool for at least an hour. 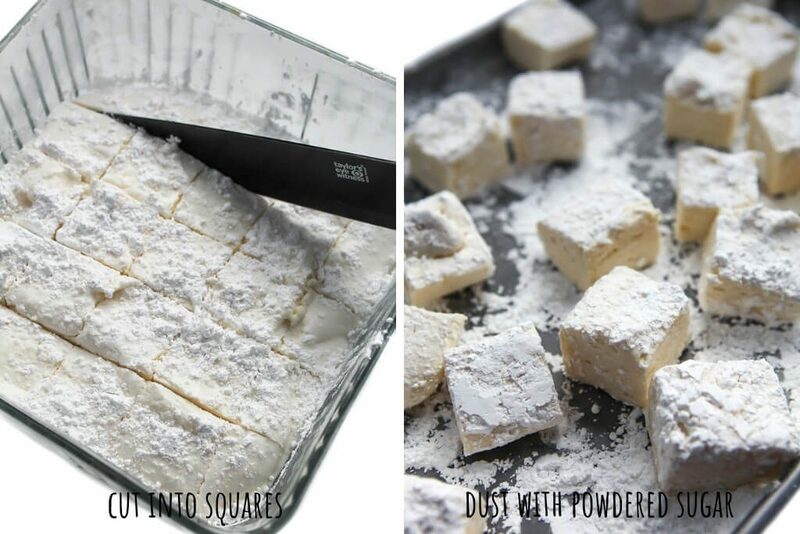 Cut into 1″ squares and dust all sides with powdered sugar. Turn your oven to 150° F. Once it reaches that temperature, turn it off and set your cubed marshmallows in the warm oven for about an hour to dry out a little. Immediately pour the marshmallow mixture into the pan while it’s still hot. (Once it cools, it will set and become firm in whatever position it’s in). Wait a full hour before cutting into squares. Make sure to turn your oven off before putting the marshmallows into it. You don’t want to melt them, just dry them out a little. How do I make flavored marshmallows? Peppermint Marshmallows – replace the vanilla extract with 1 tsp. peppermint extract or 1 drop of peppermint oil. Strawberry Marshmallows – chop up dehydrated strawberries in a blender or food processor until they form a powder. 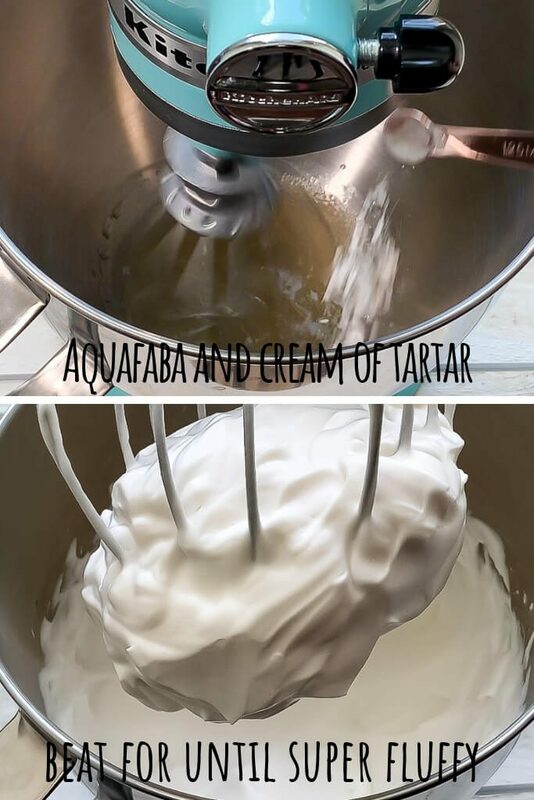 Add 2 tbsp of the powder to the aquafaba towards the end of beating. Mix another tbsp in with the powdered sugar for dusting the marshmallows. Chocolate Marshmallows – add 2 tbsp cocoa powder to the aquafaba towards the end of beating. Mix another tbsp. of cocoa powder into the powdered sugar used for dusting the marshmallows. How do I store my marshmallows? Place them in an airtight container in the fridge and they will keep about 5 days. Want to turn your vegan marshmallow into vegan peeps? Check out my homemade vegan peep recipe! 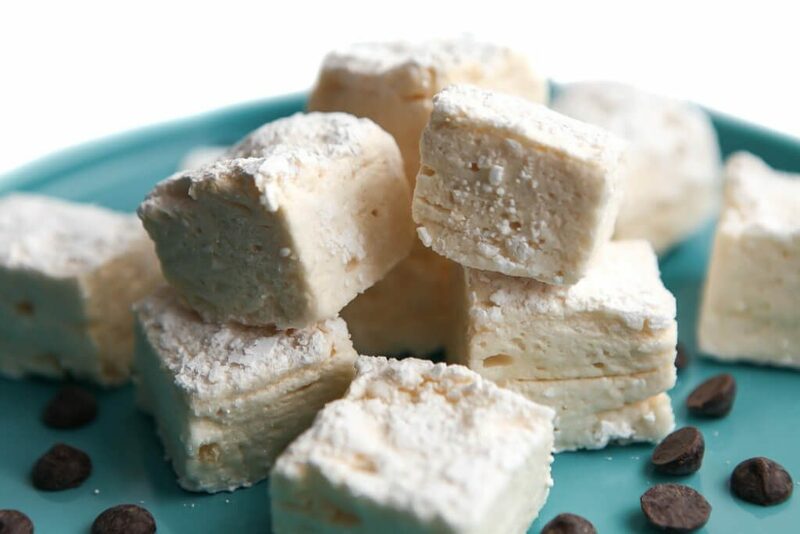 An easy way to make homemade vegan marshmallows from aquafaba. Dust the bottom of an 8"x 8" pan with powdered sugar and set aside. Cut into 1" squares and dust all sides with powdered sugar. 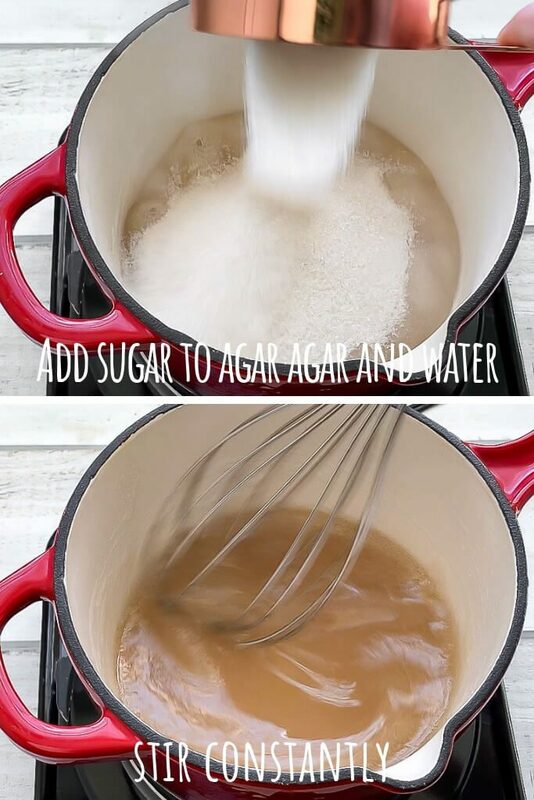 Be sure to all of the agar agar syrup to the aquafaba! Use a rubber spatula to scrape out the bottom of the saucepan to get it all. Immediately pour the marshmallow mixture into the pan while it's still hot. (Once it cools, it will set and become firm in whatever position it's in). Make sure to turn your oven off before putting the marshmallows into it. You don't want to melt them, just dry them out a little. Making them was easy but mine stayed too sticky so I must have done something wrong. I will try them again another time. But the process is quick and should work. I’m not sure why they were too sticky. They are fairly sticky until you coat them in powdered sugar and dry them out in the oven. Maybe dry them again and leave them uncovered until they dry out some more? So easy to make and nice and thick Marshmallows. I made the Vanilla ones as a starter. I was not sure if the AF would turn to liquid once Cocoa added. Glad I picked up the typo for you:). Cheers. 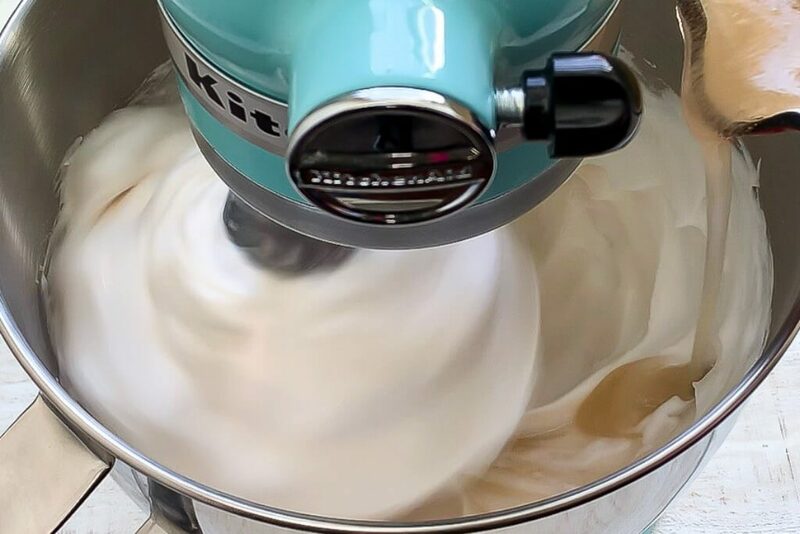 The aquafaba will stay just as fluffy once you add the cocoa powder. Liquids and especially oils tend to deflate the aquafaba, but powders don’t seem to. Oh my goodness, thank you so much for alerting me to that typo. It was supposed to say cup, not teaspoon. It has been fixed now. I hope that you enjoy them!